If there’s one simple way to give your illustrations some depth and character, it’s a noise brush. They can take a flat and boring image and turn into into something really unique. Now, there’s one solitary noise brush in the Procreate default brushes called Noise Brush (it’s in the Touchups menu). It’s not bad, but it is nice to have some options. Enter the Space Noise Procreate Brush Set…dun dun DUNNNNNN, available on Gumroad. Can I say just how much I love Gumroad? I LOVE GUMROAD. These are five excellent noise brushes made by Justas Galaburda of Iconuptopia, a site where he teaches icon design. For a sample of Justas’ work, check out his Instagram where his icon designs have a HUGE following. I’d sell a finger for numbers like this. Okay maybe not a finger, a toe perhaps, don’t need all of those anyway. The Space Noise brush set is made up of five excellent noise brushes, the different styles of which you can see above. Can I just say how much I appreciate a simple brush set with well titled brushes? These names stick in my brain a lot better than other brush sets where they might be titled ThisBrushPro and ThatBrushPro V.2 and ThemsBrushPro SUPER V.2. I’m probably going need to start naming other brushes myself based on what I use them for so I can remember them. Here’s a quick piece I did below with the Space Noise set. I’ve been looking at a lot of Eyvind Earle concept art for Sleeping Beauty lately so it probably shows in what I ended up with. The Space Noise brush set is currently available for $9.99 for early purchasers until March 4th where they’ll go up to $14.99. All buyers get any future updates absolutely FREE. Such is the magic of Gumroad. Check them out and show me what you’ve come up with using them by sending me a Tweet! Time for another art book review! I’ll be totally honest, after we got back from our Disney World honeymoon, I went a little nuts. I bought a whole slew of Disney art books because I was so inspired by the whole world of entertainment created and built on art. I never even really thought I was much of a Disney guy, but there’s a lot of really fun concepts amidst all the fluff and shiny colors. 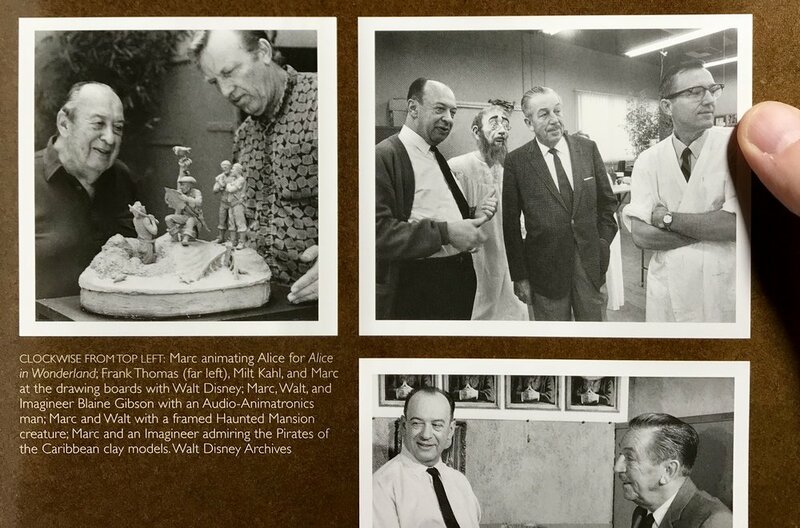 For the first book in my Disney library, let’s talk about Marc Davis: Walt Disney’s Renaissance Man (amazon link). The book itself is a nice oversized hardcover book with lots of illustrations to look at. The late Davis was an artist at Disney that had a very flexible aptitude in being able to work on animation, concept art, character design, story, and helped design many of the most recognizable attractions in Disneyland as well. This was a rarity as most of the artists focused their talents on one particular area. The book tells of Davis’ life and how much art played a central role. He was painting early in his life, always sketching, taught art, learned animation, created concept art, kept visual journals of his and his wife’s travels around the world, and also left his mark on fine art with a focus on painting later in life. His story was incredibly inspiring for me. The man just loved to make art, loved to draw, and never quit. There are pages of sketches from football games he watched on television, everything was a worthy subject for his drawing. Something I’ve tried to keep in the forefront of my mind as I always seem to be asking myself, “what should I draw?”. Some of his work I loved the most were his concept pieces for attractions like Pirates of the Caribbean and The Haunted Mansion as you can see below. To think that some of these scenes that are interwoven with the American psyche were born from the imagination of one man is incredible. As the book is pretty cheap (currently $12.99) I can definitely recommend picking it up for your own library if you want to see more of the concept work behind the famous rides of Disney parks around the world. Here in Chattanooga, Tennessee, we’re lucky to have a huge used bookseller called McKays. It’s a fantastic place to sell the books, comics, CDs, records, electronics, and games that no longer “spark joy”. The other day I rifled through their expansive art book collection and found some gems I thought I’d share. Gotta love getting some quality books at super affordable prices. These will be great to study from and pick up at any odd moment to get inspired. First of all, my wife blew my mind when she pulled 100 Tuesday Tips by Griz and Norm off the shelf that I had somehow completely missed. Griz and Norm are two Disney artists who teach drawing online through their popular series of Tuesday Tips they post for free online on Instagram and Twitter. This was amazing for several reasons. One, you can’t actually buy this book in stores, only direct from them. I’ve been wanting to for a while now, but just haven’t set aside the money. I’ve been following Griz and Norm for a long time and I love that they put out their work for free, but also sell printed copies. Well, this copy was criminally cheap. Couldn’t pass it up. How cool is that? Prized member of my art library. I still can’t believe someone sold their copy, but their loss is my gain. The drawing lessons in 100 Tuesday Tips are fantastic for learning lots of dynamic types of movement and character design that are vital in positions such as Animator for instance. Hey, I love learning all kinds of drawing techniques. You can’t learn too much, that’s not a thing. Learn all kinds of methods to do the thing you love. Lots of great design ideas throughout. Typically I steer away from any books with “How to Draw something” in the title because usually they aren’t very good at teaching you to draw anything, they just show a few process shots of how established artists go from quick pencil sketches to highly-rendered finished pieces. They’re also usually overpriced for a thin amount of information. I made an exception for this cheap copy of How to Draw Zombies. If nothing else, it’s fun to look through. I do love zombies. Also, it amuses me that this is put out by the same Walter Foster Publishing that put out those huge mid-century art books for learning everything from drawing to oil painting. I even have an old display sign (see above) from a Walter Foster book display. There’s some very nice looking horror compositions in this one. Worth the price of admission, especially if you can pick up a used copy. This next book is called Tolkien’s World. It’s a relatively thin book at 144 pages from the late 90’s, but it’s a very nice compilation of some of the best Tolkien-inspired artwork that came out before the movies. Indeed, many of the visuals from the movies were inspired or directly taken from the artwork seen in this book. And it was $3, so pretty hard to say no to a nice clean copy that will be a great coffee table book if nothing else. The book isn’t put out anymore, but it looks like you can get an equally cheap copy from lots of online sellers should you be interested. Last, but not least was the weighty tome, The Art of Fallout 4. Now, I am not a gamer (other than if you count mobile), but I’m a huge fan of the Fallout series. Fallout 4 looked like such an enticing post-apocalyptic world, I was very jealous of people who got to play it, but I was always more intrigued by the look and feel of the world itself. Luckily for people like myself, companies are compiling their concept and pre-production art for these kinds of projects in wonderful hardcover formats such as this. Colored full page artwork galore in this book. It is a masterpiece of concept art and world design. To me, it looks like they were able to compile almost every piece of concept art from Fallout 4. If you enjoy the post-apocalyptic genre, it is truly a thing to behold. These are examples of the different times of day and weather events one an experience in the game, but for an artist, it’s an invaluable resource for how to conceptualize different paths in your environmental art. Amazing stuff. 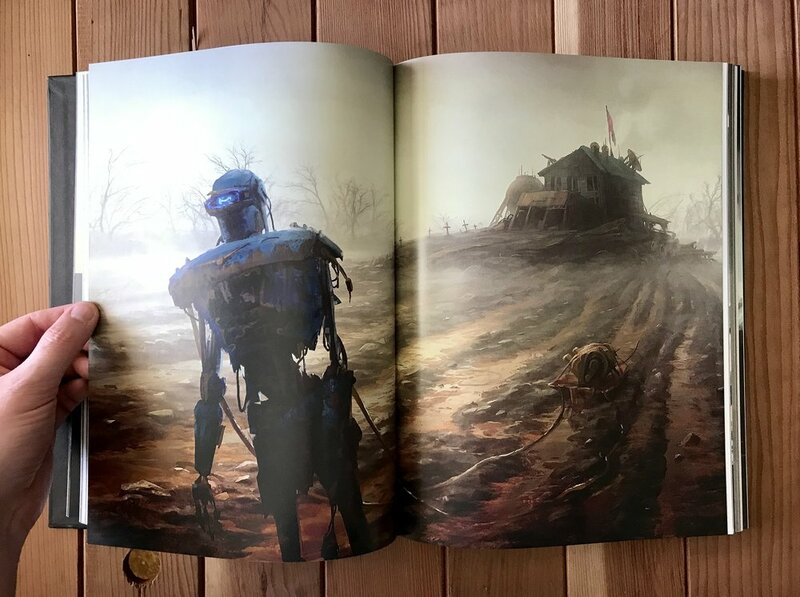 Even very early concept sketches are included in The Art of Fallout 4. These are some of the sketches I love to see the most, “napkin sketches” if you will. Such simple designs that evolved into a highly-rendered and immersive world. A delight to page through. While I’m still trying to be good about acquiring too much “stuff” these days as I’ve made downsizing my continual goal, I will definitely keep used book stores in mind for the exceptional deals one can find on art books for reference and inspiration. Have you gotten any art books lately that you love?